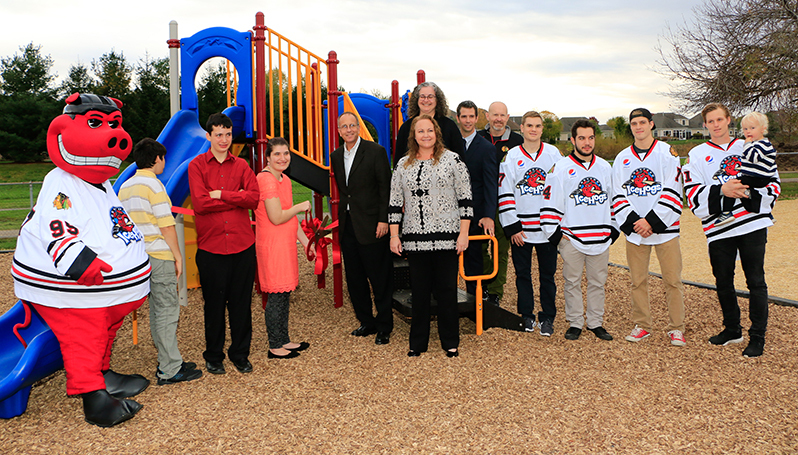 Rockford, Ill. – Community involvement continues to be a pillar of importance for the American Hockey League’s Rockford IceHogs, and through the generosity of their fans, the IceHogs contributed over $150,000 to charitable causes during the 2016-17 season. The total amount raised for the Rockford and Northern Illinois community totaled $153,171.37. Rockford hosted its 19th annual jersey auction this season, which raised $55,737 for Special Olympics – Illinois and other local causes. Other fundraising efforts to eclipse the five-figure mark included Pink in the Rink, benefitting Swedish American Hospital and A Silver Lining Foundation ($36,657), Autism Awareness Night, benefitting the Autism Program of Easterseals ($21,055), the Military Jersey auction, benefitting the Veteran’s Drop-In Center ($19,475.37) and the annual Bowl-A-Thon, benefitting Families with HD Rooted in Hope, Inc ($10,227). IceHogs players and the team mascot, Hammy, were active in the community over the last year. Players made more than 40 appearances to hospitals, schools, Jr. IceHogs practices and Bell Ringing for the Salvation Army. Hammy also appeared at over 40 events around the Forest City. IceHogs forward P.C. Labrie and Kyle Baun headlined an Anti-Bullying program. The initiative incorporated local schools as the playerse interacted with students to spread the message, “Be a buddy, not a bully.” That program has grown to allow Labrie to start an additional campaign through the “PeaCe” Foundation (playing off of the letters in P.C.’s name as well as the phonetic sound of his nickname in the locker room) to increase awareness for Anti-Bullying. Other charitable causes supported by the IceHogs during the 2016-17 season included helping to build a playground at RocVale Children’s Home, the Hammy Hustle 5K in conjunction with Meltfest, the BMO Harris Sock Drive, celebrity serving appearances at Blue Line and Prairie Street Brewhouse and the team’s annual Teddy Bear Toss. In addition, the IceHogs helped to donate 582 pounds of food through various food drives, sponsored two children to attend the Rock N Roll Institute and helped provide a hockey scholarship through the Belvidere Park District. For more information on where the IceHogs, and Hammy, will be in the community this summer, check the IceHogs Community Calendar. Season Tickets for 2017-18 on Sale Now: Don’t miss a moment of the action by reserving your seats for the IceHogs 19th season of professional hockey and 11th as the top AHL affiliate of the Chicago Blackhawks. Please contact us at (815) 847-6399 or by visiting icehogs.com to claim your spots for this upcoming season.